OmiseGo is currently experiencing slow and steady growth, recently breaking through the $2 billion market cap and pushing $20 per individual OMG. With the recent release of the open source OmeseGo eWallet and a relaunch of the OmiseGo website, OmiseGo appears positioned to make great development strides in 2018. The Southeast Asian payment-focused platform saw extreme gains over the Q4 2018 bull market, pushing the value of the token to over $26. A slow start to 2018 saw OMG drop to a low of $8.12, but a recent surge of investor faith in the token combined with forward-leaning buyers capitalizing on the dip has seen OMG rise back up to almost $20 and then fall back to $17. Why is OmiseGo experiencing this steady resurgence? We’ll proceed to analyze OMG’s recent movements and the fundamental indicators that present a strong argument OmiseGo could remain a top-25 holding in 2018 and beyond. Wait — What is OmiseGo? OmiseGo, which currently operates on the Ethereum blockchain, is a cryptocurrency that is primarily focused on driving consumer adoption by delivering scalability, high transaction speeds, and ultimately bridging the gap between fiat currency and cryptocurrency. The OmiseGO partnership with McDonald’s generated a lot of news within the community. Omise, the parent organization behind OmiseGo, is heavily committed to implementing merchant solutions and has already made significant inroads in the Southeast Asian market to this effect — In 2017, Omise announced a partnership with McDonald’s Thailand that places the platform as the exclusive payment gateway provider for both the Thai McDonald’s website and McDelivery Thailand app. The OmiseGo platform intends to facilitate seamless cryptocurrency payments with any merchant that adopts the Omise solution, allowing consumers to instantly convert crypto into fiat upon purchase. 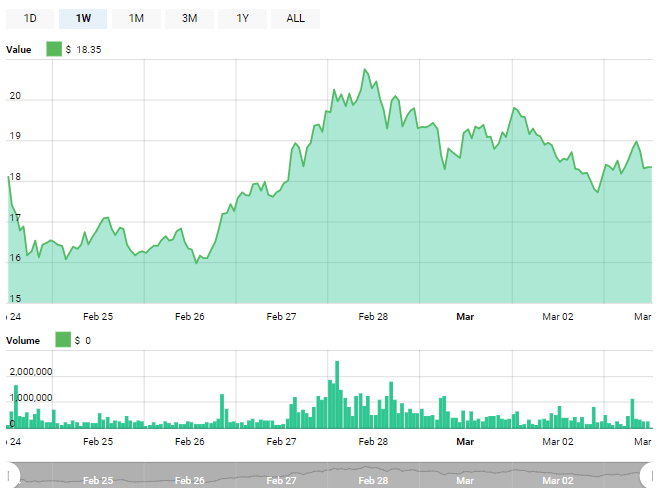 OMG has recently demonstrated a slow and steady resurgence in value, climbing from $8.12 halfway through February to a peak of $20 at the end of the month. With the OmiseGo token experiencing a +3.52% positive shift over the last week despite a short correction following the late February peak OMG, is rising in tandem with Bitcoin’s +2.76% 7-day movement and general positive sentiment across the board. Huobi is currently the largest exchange for OMG, with more than 20% of the last 24 hours of volume conducted in OMG/USDT via the Chinese exchange platform. Ethfinex and Binance take up the positions of second and third largest exchanges for OMG volume, trading in OMG/USD and OMG/BTC respectively. The OmiseGo team have also recently announced the release of an open source eWallet SDK, paving the way for the development of mobile apps. An Android app sample is already available, alongside a sample iOS application that demonstrates the SDK in the iOS environment. Notably, the OmiseGo team are heavily invested in the integration of the Ethereum Plasma scaling solution, which is set to allow the OmiseGo platform to compete with established payment processing services. The Plasma solution is a non-proprietary community effort that aims to optimize smart contract execution on the Ethereum blockchain, and OmiseGO is an integral element of the development process. Established payment gateway platform Stripe has also recently endorsed OmiseGo subsequent to their withdrawal of Bitcoin support. While Stripe hasn’t voiced any official indication that the platform will be integrating digital assets such as OMG, it has spoken favorably of the OmiseGo solution and hinted towards the possible adoption of contemporary cryptocurrency solutions. Will OMG’s Upward Trend Continue? With plasma integration around the corner, OmiseGo offers early adopters the possibility of a platform that allows them to use one single wallet service to pay for goods and services with a wide range of different cryptocurrencies. The recent update of the OmiseGo website, accompanied by strong chart performance and a rapid-fire barrage of developmental announcements places OmiseGo in a strong position to compete for a share of the crypto payment processing sector in 2018. For more information about OmiseGo including its current price, market cap, technical information and social media links, please see our OmiseGo coin profile. Disclosure: CryptoSlate staff has a financial interest in OmiseGo. You can read about our disclaimers, disclosures, and guidelines in our Editorial Policy.